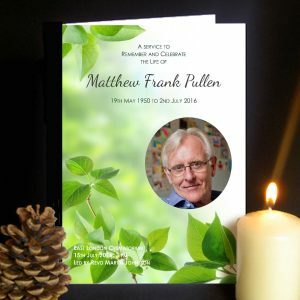 A printed personalised funeral order of Service is a perfect compliment to any funeral. 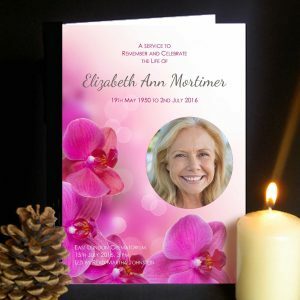 Our compassionate and professional approach will enable you to create a bespoke order of service with minimum fuss. 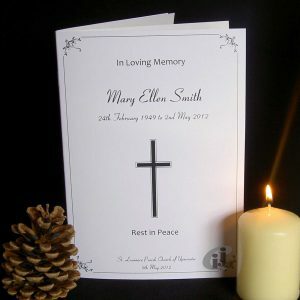 Personalised as required making them applicable to both religious and humanistic funerals alike. 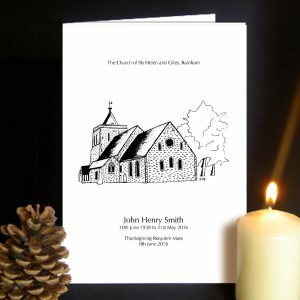 You supply us with the basic content including photo's, poems, hymns etc and we take away the stress and do all the tricky work like laying out and making them print ready for you. Printed and dispatched with one working day from your approval 1st class postage included but options for tracked or guaranteed (to most UK postcodes) next day delivery available at checkout. An A4 sheet of card folded in half giving you up to four sides for your content. Our most populaer style with just enough room for the service details or a poem or reading. An A4 sheet of card folded in half plus one insert sheet giving you up to eight sides for your content. Better suited to services where there is a reasonable amount of content with full hymns and prayers perhaps. An A4 sheet of card folded in half plus two insert sheets giving you up to twelve sides for your content. Ideal for a Catholic funeral requiem mass perhaps where there are hymns, responsal prayers etc. 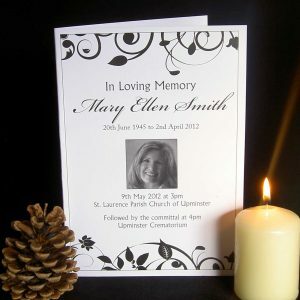 Or an order of service keepsake program where there are many photo's and poems etc. 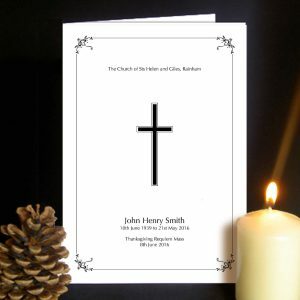 The above styles give you all the flexibility you need from a simple memorial keepsake with just a poem perhaps to a full requiem mass or maybe a series of photo's remembering those cherished moments. Your content drives the style. When you are ready just send us your wording and photo’s. 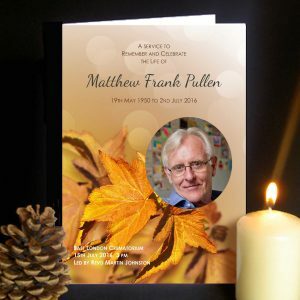 We will then design and layout your funeral order of service ready for you to approve. 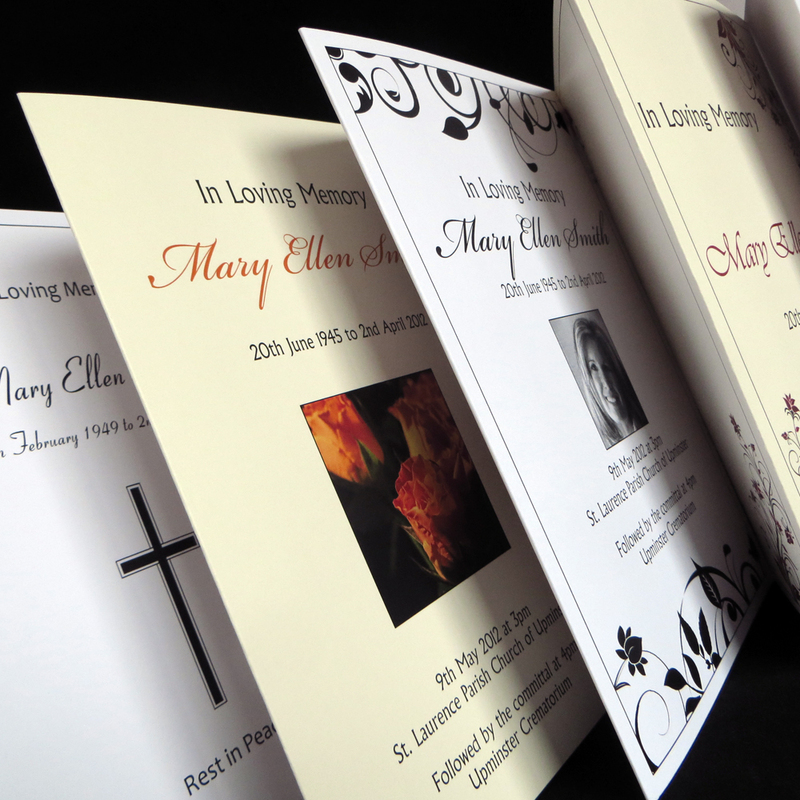 Once approved, we dispatch within one business day, this is all part of our funeral printing service. 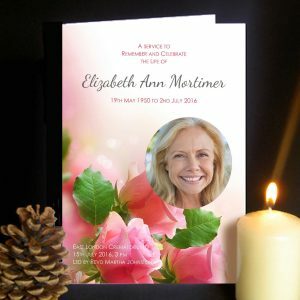 The service sheets or leaflets are made from a 250gsm card and the booklets or programs are made up of a 250gsm card cover with 130gsm quality paper insert sheets. 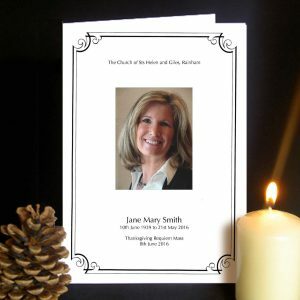 Designed for Baptist, Catholic, Christian and non religious cremation, burial or memorial services. We can adapt where needed for other religions, you just need to advise us of your particular requirements. Just click on one of the above designs and scroll down to "How To Order", then follow the simple instructions.